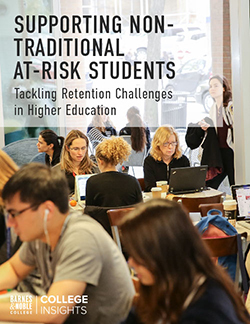 Barnes & Noble College stores have a long history of providing for the needs of college and university students, faculty and staff, but recently, the company’s retailing skills were called upon for a store of a different kind. As part of the Southern Methodist University (SMU) campus in Dallas, Texas, the new $250 million George W. Bush Presidential Center opened recently to great media fanfare. Featuring an archival library, a museum, and a public policy center, it also includes the Bush Center Store. 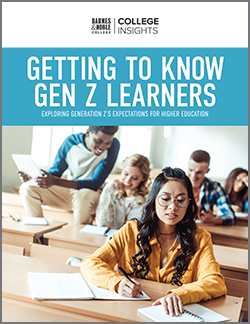 Preparations on the new store began over eighteen months ago, building on Barnes & Noble Colleges’ existing relationship with SMU. 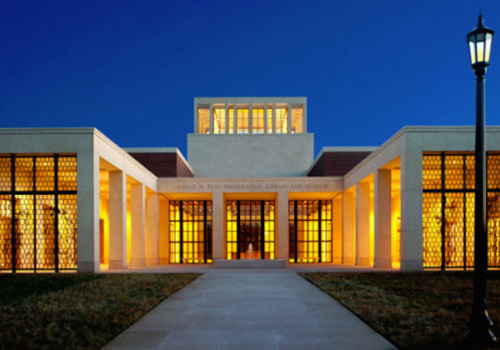 Although the Bush Center provided the design and layout of the 1,600 square-foot store, matching the wood and stone décor of the Presidential Center, much of the merchandise selection was chosen by the former First Lady Mrs. Laura Bush. “Mrs. Bush wanted the items in the store to be made in America,” points out Barnes & Noble College Regional Manager, Mark Kerin, “and we were happy to comply with that request.” Included in the wide array of merchandise is apparel with the presidential center logo, caps, office accessories, autographed baseballs, even a George W. Bush bobble-head. The store also carries replicas of items produced from former residences of the Bush family, including rustic chairs and botanical prints from Camp David. 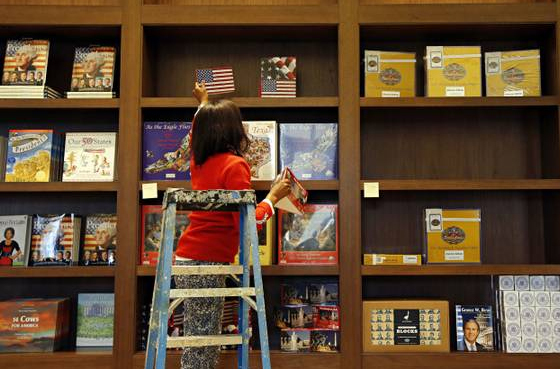 Stocking shelves in preparation for the opening of the Bush Center Store. “There are many items in the store that represent particular interests of the Bush family,” Kerin explains. “For example, we carry puzzles that the Bush family especially enjoys, and products from ARZU Studio, which creates jobs for Afghan women,” he adds. The store showcases books written by family members, including Decision Points by President Bush, Spoken from the Heart, Mrs. Laura Bush’s memoir, and Read All About It, a children’s book written by Mrs. Bush and her daughter Jenna Bush Hager. Many of Mrs. Bush’s favorite books, which were included on her White House recommended reading list for families, are available, from children’s books to Truman Capote and Dostoevsky. The Barnes & Noble College team was also charged with the development of the store’s website. 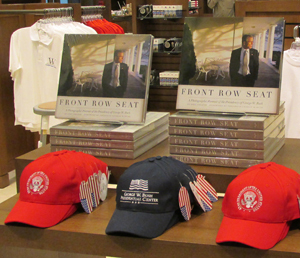 Accessible from the Bush Center site, the Bush Center Store website includes an on-line catalog of merchandise and required being built as a stand-alone website – the only one in the company that operates on a different platform. The Bush Center was officially dedicated on April 25, 2013, by President and Mrs. George W. Bush, who were joined by President Barack and Mrs. Michelle Obama and former first families George H.W. and Mrs. Barbara Bush, Jimmy and Mrs. Rosalyn Carter, and Bill and Secretary Hillary Clinton. Thousands of friends, supporters, dignitaries, and alumni attended, including Karl Rove, Karen Hughes, Dr. Condoleezza Rice and former White House photographer Eric Draper, who signed copies of his book, Front Row Seat: A Photographic Portrait of the Presidency of George W. Bush.